Looking for a get away in the heart of the Aska Adventure area? Do you like to rock on the screened porch and watch wildlife wander past? Would you like to take a long walk down a country lane or be only a mile from the best fishing holes around? If so, this is the cabin for you. This cozy cabin is in a private location right in the heart of the best that Blue Ridge/Aska has to offer. 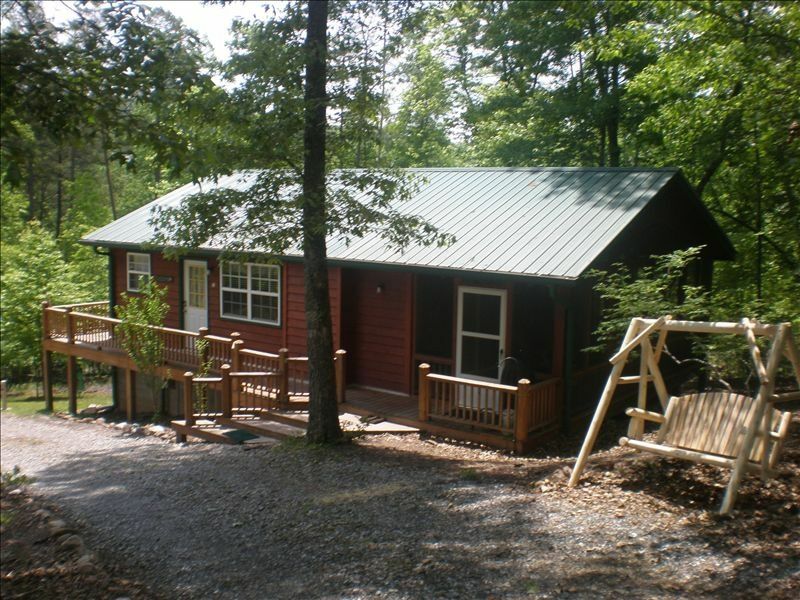 Situated just 1 mile from the Toccoa River with easy access for fishing, canoeing, or tubing, the cabin is sure to please. Only minutes from the Benton/McCay and many other hiking trails and water falls as well, you can hike all day and come home to a long soak in the hot tub. There are also, several beautiful walks right outside your door if you want a stroll down country lanes. This cabin is only an hour and a half from Atlanta making it the perfect vacation spot and with Wi-Fi available it can't be beat. Beautiful year views through the woods, quiet country lanes, outstanding fishing and adventure sports all await you. Call or email today to make reservations or ask a question! Ask for Tim or Beth. There aren’t enough words to say how great this place is!! Peaceful, lovely, scenic, homey, cozy, comfy are just a few! Can’t wait to come back!!! Really enjoyed the 4-night visit. There are just way too many 5-star reviews in the world, so don't be misled by my 4-star review! Owners communicated very well. The cabin is very nice and a bargain at $85/night. Not hard to get to, about 30 minutes out from Blue Ridge. Beautiful screened in porch on ground level with nice hot tub. Kitchen is easy to use and well-equipped. Two smallish but comfortable bedrooms. Just used one bedroom but found the bed very comfortable.The bathroom would be a bit small and might be tough for a family to use. Fine for a couple. There is a neighbor nearby. Never saw them or heard them, which is just fine. (I'm sure they are nice people but weren't looking for visits from neighbors.) If you're looking for a view of the mountains (I wasn't...was looking for something more wooded), this probably isn't it for you. Let's see, what else. Very nice gas-burning fireplace. Deck off the master bedroom with nice view of woods, mountains through the woods, and beautiful, large backyard. You can see a few other cabins but...and this is hard to explain, still seemed secluded. Never saw another person! Really super-nice fire pit with seating outside. Anyway, we plan to book again. Nice property! This is our third year at this cabin. It is a great cozy cabin, perfect for our family. Lots of wildlife,we saw deer every night. Tim is very responsive to messages and a pleasure to work with. We can't wait to return next year!!! We had such an amazing time! It was very clean and well maintained, and the area was absolutely beautiful. We highly recommend it! Càbin was well stocked with many essentials and spotless. Not far from Blue Ridge or Ellijay. We especially enjoyed quiet times relaxing in rockers watching deer. Thanks for your hospitality. Can't wàit to return! Awesome cabin away from concrete jungles. Cabin was exactly as we had hoped and the five of us had a great bonding time as we enjoyed the beautiful parks of Georgia. Thanks Tim and Kathy for sharing it with us. In the Heart of the Aska Adventure Area!